Mr Hyder Ali, Government Clerk (retired) has been struggling to fill his days since he gave up work. It’s not easy for his wife either. She’s going crazy at him fussing around the house and wishes he’d get out from under her feet and find something to do. You might suppose he’d take up golf, collect stamps or spend more time at the mosque but instead he comes up with the unlikely idea of starting a marriage bureau. With decades of his own happy marriage behind him and a keen understanding of human nature, it’s just the job for a man in need of distraction. Of course it’s not just ‘any’ marriage bureau because Mr Ali is smart enough to know that all good businesses need a point of difference, something to make it stand out in a busy marketplace. His business is thus the “Marriage Bureau for Rich People“. Oh if only we could be so blatant in our branding! The setting for our tale is Vizag, a coastal town in southern India which I had assumed was a fictional place until I checked it out on google and found it really does exist. Vizag has a number of nicknames including ‘City of Destiny’ which seems like it ought to be a good place for match-making. Mr Ali’s mission is out to bring joy and happy marriages to all – Christians, Hindus and Muslims, it makes no difference to him – he’s an equal opportunities matcher. For 500 rupees up-front payment (about £8) he’ll advertise your needs, send you lists of potential spouses and – when needs must – step in with advice on all matters matrimonial. With his assistant, the lovely Aruna whose filing skills are second to none, Mr Ali is soon building a vibrant and successful business from his veranda, making matches and building his client ‘lists’ like an American pyramid seller. It might not be quite what Mrs Ali had in mind for him but Mr Ali is a natural at the business of matchmaking. For Aruna there’s deep irony in her new job because she has a failed engagement behind her and little prospect of future happiness. She’s of an age to marry – perhaps a little older – but her father’s illness has eaten up all the family’s resources and they just can’t afford a marriage let alone a dowry. Who would help her parents and support her sister through college if Aruna married and wasn’t working? They may only have a one-room home but even their modest needs are beyond their budget and she has the double difficulty of being both poor and ridiculously high-caste. For Mr and Mrs Ali not quite everything in the garden is lovely either. There’s the small matter of their son, the political activist, who still hasn’t been married off and keeps getting arrested. Will Aruna meet her match, will the Ali family keep their son out of trouble and will Mr Ali’s clients all find their own happy endings? In a style very reminiscent of the Number One Ladies Detective Agency and with a plot that’s positively Jane Austin-ian, Farahad Zama has created a community of characters with whom I couldn’t help but fall in love. I won’t claim I believed EVERYTHING – I thought a certain degree of suspension of disbelief was perhaps needed to accept the idea of a multi-religion agency run by such an angelic man with such a detailed knowledge of all the Hindu castes and sub-castes. At times the son of Mr and Mrs Ali didn’t seem to be the right age for the activities he was engaging in and the sick child of Leela the cleaner fitted a little two neatly into the final romantic plot twist but on the whole, I was more than happy to put those doubts aside. Zama paints a picture of a simpler, gentler society of good honest people in search of a good match for their children or siblings. I suspected that any such agency would probably get a lot more abuse and a lot less success but I was content to occupy this simplistic idyll for the duration of the book. In the west, we’re all too quick to reject the idea of arranged marriage and often quick to equate ‘arranged’ with ‘forced’. Mind you, in societies based on love marriage and making our own choices, we’ve not proven to be very successful at picking for ourselves if the divorce rates are anything to judge by. I’m willing to be open minded about the Indian system and to accept that families would need a helping hand in order to find a match outside their immediate social circle. Suitor by suitor we are introduced to (mostly) very believable characters as Zama builds a delightful and endearing tale of modern Indian matrimony across religions and caste structures. I would guess that I probably know more than many readers about Indian religions and the caste system but I still found this fascinating stuff. When we go to India on holiday I always enjoy the matrimonial advertisements in the local newspapers with their precise specifications and clichéd descriptions – does anyone outside India really know what a ‘wheaten’ complexion is? 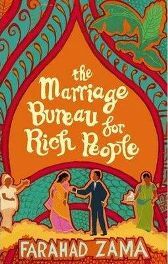 As Mr Ali takes us through the thorny issues of dowry and political intrigue between and within families, we can’t help but conclude that the issue of finding the perfect match is almost infinitely complex. Through Mr Ali and his assistant I learned about how even the most exacting specifications could be matched and how certain impediments to matrimony (divorce being probably the worst, and lack of money almost as serious) could be overcome. We attend weddings with Mr and Mrs Ali and listen in on his advice – to one man who has no family to negotiate for him, he advises him not to talk to the potential in-laws about his job in the ‘valves’ trade and how to ‘spin’ what he has to offer in the best possible light. It is quite simply a delightful and joyful little book. People often worry about whether a book set in India will be full of ‘lingo’ that they just don’t understand. Many such books come laden with a glossary of local terms in the back but there’s no need for anything of the sort with this. There are admittedly a lot of complex caste and sub-caste names but quite honestly I didn’t know them, didn’t remember most, and didn’t feel I missed anything for not having that knowledge. Relax – this is easy-India and a million miles from the slumdog-genre of poverty and misery that characterises many of my favourite Indian novels. There really is room for joy on the sub-continent and this jolly little tale proves that. One thing that totally surprised me – and revealed some of my own prejudices along the way – was the discovery at the end of my second reading of this book that the author is actually a man. So much for all my theories that you can tell the gender of the writer by the style of the book. Despite the male lead character, I was completely convinced this was written by a woman but I was totally wrong. Not only is he not a woman, he’s not got a typical background for a writer of a light romantic comedy. He’s an engineer by education and worked for an investment bank. He now lives in London, works in the city and writes on public transport whilst he commutes to work. So maybe not all investment bankers can be tarred with the same brush. I didn’t get round to writing a review when I finished this book and I kicked myself for being lazy. I actually sat down and read it through a second time just so I could write about it – the first time I’ve done that intentionally (I sometimes do it accidentally) in many years. Today I discovered that there’s a follow up to The Marriage Bureau for Rich People – I’ve ordered it already and I’m confident that if it’s even half as good as this one, I’m going to love it. It could just be a match made in heaven. No Comments on "The Marriage Bureau for Rich People"